Preseason. The period of time where you experiment a little bit and settle in a little bit while getting a little idea of what the season will be like. The preseason doesn’t tell the whole story of course, it can be misleading or accurate. Last season, our preseason tour in the US had many fans thinking we were going to be unstoppable under Roberto Di Matteo. Our new signings looked sharp, especially Marko Marin as we performed exceptionally well overall. The season didn’t reflect the preseason, at all. A turbulent season that saw RDM sacked and Rafa Benitez appointed as interim. We had the chance to win 7 trophies and only won 1 (Europa League). A disappointment to say the least. However, this year maybe different. We saw some experimentation from Jose Mourinho as he travelled across the globe playing in many friendlies. We saw youngsters get playing-time, last seasons loanees played quite often, a few new formations came to use and we didn’t see some of our best players in action. Asia Tour – Singha All Stars (1-0 W), Malaysia XI (4-1 W) and Indonesia XI (8-1 W). We didn’t see much of David Luiz, who is without a doubt, our best CB. John Terry featured quite often and was pretty impressive, however, Gary Cahill was not. Branislav Ivanovic had his moments of brilliance and failure. Cahill is too inconsistent as of last season, Ivanovic looks likely to be cover for Azpilicueta at RB and that leaves us Luiz and Terry. Terry has injury problems, missing quite a lot of action last season. Should he get hurt, we wouldn’t have proper cover or should Luiz get suspended, we wouldn’t have proper cover. Our youngsters are expected to go on loan (Chalobah) and others are expected to be with the reserves/U21 side (Ake). This is obviously a huge problem for us. We might struggle defensively or we might not. We had little to no problems up until the tougher opposition. Both Milan sides and Roma gave us some trouble, but Real Madrid had us all types of confused and lost throughout the match. Maybe, we’ll regret the decision to not buy a CB or we won’t. However, Mourinho is known for organizing defenses very well. Let’s hope that is the case this time around. Chelsea fans expect too much from Lukaku, Torres and Ba. Especially the first two. Last season, we were stuck with the unhappy and selfish Sturridge (who was later sold and replaced by Ba) and the misfiring Torres. Torres played a majority of the games and was on and off. Demba Ba arrived as Newcastle’s top goal-scorers and the EPL’s top 3 goal-scorers, but he never found his touched as a Chelsea player. Lukaku was shining on loan at West Brom as we struggled with Torres/Ba. Now that all 3 of them are together, we have seen glimpses of greatness and glimpses of poorness. Lukaku was on fire in Asia, but couldn’t find his feet in the US (service was sub-par to be fair). Torres came into the picture late and was pretty good, but never got a goal to his name, so he can’t really say he was the better of the 3. Demba Ba was on and off, he had his moments, but never really showed himself. This all being said, we might go through the same pains as last year if we don’t get a new striker. Signing Suarez or Rooney would be a huge boost for us and our hopes to win trophies. My vote is for Wayne Rooney. Possibly a bold statement, but I think it’s the truth. The Bison showed glimpses of his old-self and was very consistent throughout the preseason. He paired up well alongside Marco van Ginkel in Asia and Ramires/Mikel in the US. Essien is, without a doubt, one of the best defensive midfielders the club has ever heard. Him and Mourinho have a father-son relationship that is a better love story than Twilight. I think Essien’s only problem might be playing 90 minutes every week, but his physicality is definitely there (it always has been), his passing is very good and he offers a lot of cover for the back 4 while being able to run forward and contribute something to the attack. I might be wrong, but I think Michael Essien has shown himself very well this preseason and if he is a regular, this preseason will play a huge role in Mourinho’s decision to bring back the bison. 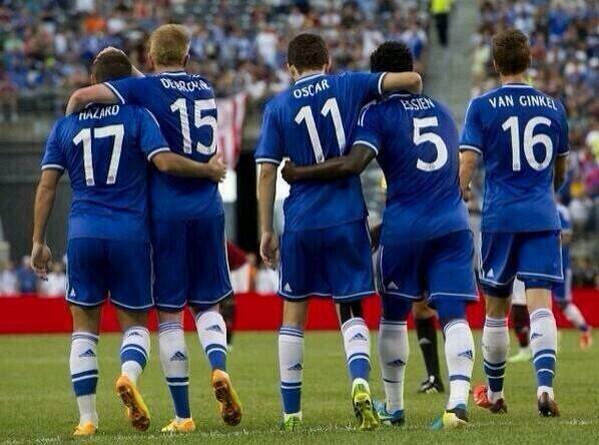 Marco van Ginkel, Kevin De Bruyne, Wallace and Oscar really showed themselves well this preseason. van Ginkel, who was bought from Vitesse earlier in the preseason, showed signs of Essien and Makelele in his playing style. His challenges were almost always timed perfectly, he was composed on the ball and was a decent passer throughout the preseason. Kevin De Bruyne played on the right and in the central roles and was absolutely fantastic. He was distributing the ball unbelievably well while creating space for other players to run into and also setting up other players for goals/chances. He was one of Werder’s best players last season when he was on loan there and expressed his desire to get regular football. He deserves it. Wallace played in the Asia Tour and surprised a lot of fans, including myself. He was incredibly impressive this preseason. He offered a lot to the attack with his crosses and was pretty good defending. While he was playing against lesser opposition, he has attracted the names of Inter Milan and other clubs as a possible loan destination. (Inter looks most likely). Oscar finally got a chance to play that number 10 role and he was very impressive. He was playing very well with Brazil in the Confederations Cup and shone for them in their triumph. He was calm, composed on the ball while setting up other players and finding his way to get a shot or two on target. His distribution has always been there and it was on display in the preseason Chelsea tour and the Confederations Cup with Brazil, he has matured remarkably since last season. All of these players have impressed and deserve to play first team football whether they are loaned out or at the club. What is your take away from the preseason? Please leave your comments and Thanks for reading! You are very wrong.our pre-season with rdm wasn’t good despite early good sign by some players. Honourable Mentions: Bertrand Traore, Victor Moses, Romelu Lukaku and Ramires.